As I posted earlier in the week about attempting to get Erik into a particular high school which has low intake numbers and a penchant for children with areas of particular interests or talent. As I wrote then, Erik likes to draw and is pretty good at it. He's no child prodigy, but he is good. He used to draw all the time, but in the past year or so this has dropped away. Eighteen months ago he did a short art course at the local art centre. From that course, he produced several pieces which were good enough to enter into the school's annual professional art show (artists from the local community enter, this is not for school students, though occasionally they enter as well). He sold a piece from that show and was very pleased with himself. 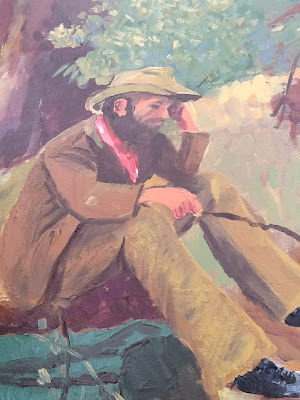 Erik painted the face and hat of the man in the reproduction. He did enter a piece into the art show again, and again it sold, so last year was still relatively productive for him. So, anyway, we have this interview coming up and it would be great if Erik had a bit of a portfolio of he work to show the principal (they haven't asked for this, this is just my idea). I was talking to him about this and asking him why he'd pretty much stopped drawing outside of his art class at school and he told me that basically he enjoyed people enjoying the things he produced. When he was in grades three and four, the kids had more free time in school and he would draw and his classmates would be excited about his work. In grades five and six there hasn't been as much free time for drawing, and when he does draw, they aren't as impressed. So, the boy thrives on feedback and accolades. Okay, so this might cause some of you to think he's pretty vain. Most artists are though. We all love the thrill of people enjoying what we do. We love to impress. Yes, we also love the actual production of art and playing with media but in the end, if no one ever admires our work, it tends to drain our enthusiasm a bit. I looked up the local art centre to find out if they were running any courses, and they are. It's expensive, though. I've talked with them about a short term payment plan, and even still we'll struggle to make it happen, but I feel it's worth the effort. I think doing this short course might reignite his creative inspiration. He would be with other artists. He would be given tasks to challenge and stretch his skills. He would have products at the end of each session to mark his progress. He would have opportunities to develop new ideas and consider new possibilities and freshen his approach to what he creates. The dilemma is always the same though. Spend $270 on one child to do something they love, and that's always going to be money taken away from the other children, who also have interests they'd like to pursue. It's really tough having to make these choices. Maybe it's just Erik's time, right now? Maybe it is unfair because we live in an imperfect world? I know Luey would really like to do tennis or guitar lessons. Bryn and Ari haven't expressed any desire to do anything that we can't provide at home. I hear a lot of parents say they treat all their children exactly the same. One doesn't get if they others can't get as well. It just isn't an option for us a lot of the time. Right now, if we had to also give Luey a shot at doing something he'd like to do, we couldn't afford to let either boy doing anything - the money simply won't stretch that far. So, neither boy would do any extracurricular activity (which is the status quo here, because we can't afford to send more than one child at time to anything, we never send any of the children to anything). This course serves a greater purpose - in that it *might* help Erik seem more attractive to the high school we'd like him to go to (or it might but, but if we don't do this, we'll never know what could have been). Tennis or guitar lessons on the other hand would not serve a greater purpose right now. Also, once this is done, I guess it will be Luey's turns next, right? I agree with Jayne. The other boys aren't missing out all together. there time will come. Spending the money for Erik may have a roll on effect for Luey. If Erik gets into the school due to this art course, then when it comes time for Leuy to start high school, it may be easier to get him in as a sibling. I hope Erik has a wonderful time. I guess the flip side is, would it be fair for Erik to miss out because the others don't have anything they're interested in right now? Their time will come, like the others have said. My in laws have this notion of fair, in that everything has to be divided equally. When my brother in law and his wife need money (which is a lot), we will end up geting a lump sum somewhere down the track to even it out. But it's not even. Because the relationships are not even, and it feels like they are trying too hard. I think fair and even is overrated. Kids are different, and will have different goals and talents. My eldest has been doing ballet for years and technically that means we should be doing something for the other kids too, but at this point they, are not interested, so we don't worry about it. Kids need to be given every opportunity to be the best they can be, at them. It doesn't mean that we let them do every sport or extracurricular activity they show an interest in; I think that's ridiculous. But when they do show a proficiency in an area, I think we do everything can to promote that, and encourage it. As for recognition, that's fair enough. He is still a kid, so he hasn't seen the bigger picture yet, and let's face it, we bloggers are so much happier when someone is reading our posts.